The flats in our block are in a sort of semi circle and bang in the middle of that semi circle there is a park. Many years ago it was totally barren with not even a blade of grass growing in it. Even the smallest gust of wind would blow the dust from the park into our houses and we would crib and grumble. The kids would not play in that park and no one would go for walks there because everyone simply found it too dusty and dirty. One fine day,a retired gentlemen living in one of the flats decided to put this piece of land to good use. He asked the municipal gardeners to come and grow grass, put in some plants and generally create some greenery. Obviously the gardeners couldn’t be bothered. When he forced them to come saying that the park was a municipal park and hence their responsibility; they came but all they did was lie in the shade and smoke beedis. They had the long list of excuses, the water pump is broken, the garden hose is not long enough, our equipment is too old etc etc. Undaunted, the gentleman took things in his own hands. He visited the local nursery, got some seeds and started to grow grass in the park. He dug up the earth, made flower beds and started planting flowers. By this time the rest of us grew interested in what he was doing. We all came forward to help. We got together and painted the park’s outer walls. The rusted gate was replaced with a new one. A jogging track was put in. Swings were brought in for kids and benches for people to sit on. We didn’t get a penny from the MCD- the people who were actually responsible for the park. We all pooled in with whatever time, money and resources we could spare. The retired people all pitched in with the watering and general maintenance. Others pitched in buying new plants and doing the heavy stuff like carrying around flower pots or the heavy digging. The kids took it upon themselves to ensure no one was plucking flowers or littering the park. I am sure they also got valuable lessons in gardening and most importantly on the value of team work. We started a park fund, replaced the faulty water pump and brought in two gardeners. The days when a windy day meant dusty houses are long gone. Now a fine wind finds almost everyone in the park, playing, relaxing after a hard days work or just catching up. You can smell the raat ki raani and the mogra as soon as you enter.The flower beds are filled with roses, dahlias, sunflowers, marigolds and many exotic flowers. A corner of the park is devoted to growing herbs that everyone uses as seasoning and for minor ailme nts. I am lucky enough to have our front door open right in front of the park and we have a fantastic view of the greenery from our living room. The snap here was taken from my living room window when it had just finished raining. There are hardly any flowers in this season but the greenery is just amazing. This park is not only an oasis in the madness and heat and traffic and general chaos of Delhi; but it speaks volumes about what a little bit of determination and a lot of team work can achieve! @ Salil - Cant imagine a life without trees and mtns ! yeah ..it was hard work but we have a lovely garden to show for it ! Wow! 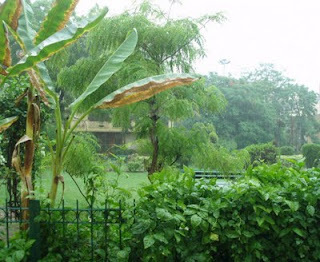 That greenery in the middle of a city - an oasis for sure! Gr8 job by that Uncle and a pat on the bk for all of u who were involved! @swaram - yeah its grt to have ur own oasis bang in the middle of the city !